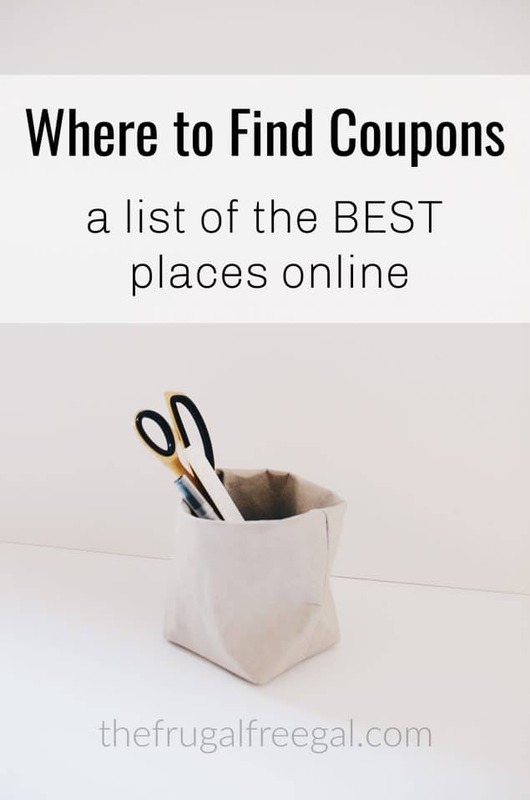 I often get asked the question, “Where are the best places to find online printable coupons?” I search for online printable coupons often and I trust the sites listed below. I’ve been using these coupon sites for a few years now and these are my “go-to” places. If you are looking for the best online printable coupons, I recommend the following coupon sites below to save big on your next purchase. You’ll also find coupons online, digital coupons, and brand coupons below. Amazon Coupons – That’s right! Amazon has several coupons that you can clip online before you check out! You can find coupons for beauty supplies, baby items, household supplies, outdoor gear and clothing, electronics, personal care appliances, industrial & scientific, kitchen, and Prime Pantry Coupons. Ebates – earn cash back on your online purchases! Ibotta – With this FREE app, You can find great rebates on your favorite products such as milk, yogurt, and lots more and redeem the rebates for REAL cash! I have this app installed on my smartphone and I use it on every shopping trip! Checkout 51 – Every Thursday morning, Checkout 51 updates with a new list of offers. All you have to do is pick the ones you like, purchase them at any store, and upload a photo of your receipt through the mobile app or website. When your account reaches $20, they send you a check. SavingStar – Earn cash back on your groceries with exclusive freebies, coupons, and big savings on your favorite brands. Link deals to your store loyalty cards or submit a picture of your receipt to earn money in your SavingStar account. Betty Crocker – Get exclusive coupons (up to $250 per year in savings). Kellogg’s Family Rewards – A valid email address is your key to bonus offers, free points, special offers, money-saving coupons, great-tasting recipes and so much more! Browse through each of these online printable coupon websites and other money saving tools to find great money saving coupons! Why should you search for printable coupons? Where do you find coupons online? Let me know below! Save Money on Ink: When printing coupons, make sure your printer settings are at “Black and White” and print using the “Quick Print” setting. This will save you ink. Ink can be expensive, so you want to make sure you aren’t wasting ink on coupon prints, which could be “costing” you money. Print ONLY the coupons you know you will need and use to save the most money. You can also purchase refill ink . It’s less expensive than regular ink. Great list. I get a lot of coupons for dining by signing up for their clubs. They would usually send a buy one get one free or 50% lunch or dinner coupon every few weeks. They really can help if you like to eat out. Favorite — well hard to say — Coupons.com or Target coupons! I use Coupons.com and Target alot. I never thought about setting my printer to black & white. I will have to do that from here on out. I go through way too much ink sometimes. I have used several sites, bur I think I like coupon.com the best. I print coupons from, smartsource, coupon network. I find many coupons right here on the frugal free gal. coupon database, my fav by far! Always using Target coupons. Love the deals you can get with them. Also use coupons.com a lot. Using different zip codes will sometimes get you a few different coupons. I look on coupons.com mostly. Thanks for the links to coupons! I do use coupons.com the most and coupon database if I’m looking for particular coupons. Redplum.com is a good site- I often find coupons for items I need. I use several of these sites but recently I started printing them off of Swagbucks because you can earn “bucks” for redeeming them so that’s more money! coupon cabin is my favorite. forgot to mention that I have been using smart source for a long time! Thank you for sharing there is a few there I had no clue about thank you! I tend to use coupons that go right to my grocery card (Kroger). Thanks for all the great tips!! I probably use coupons.com more than any other site, but have found some great coupons elsewhere too. The advice about using only black & white was good, I had not really thought about that before (although my printer is only black and white, so I didn’t have a choice). Only occasionally do I have problems using printables at the store, and it’s typically for the higher-value coupons. It’s definitely the way to go, since I can print only the coupons that I intend to use. Thanks so much for the easy links! I use coupons all the time — it’s like printable money! Lots of great suggestions. I didn’t know about the Target site. Thank you! this is a great list, didn’t know about some of these thanks! Oh that’s a great list – especially to have all in one place. Thank you for compiling it for us! Thanks! I didn’t know about all of those! I like uspromocodes.com and retailmenot.com. These sites are my favourite and i’ve already saved a lot thanks to them. So i can recommend them to you too .. Thanks for the summary all on one page. I get coupons from misc. places, nice to see them all one one site. Thanks for the tips too. I HAVE NEVER HEARD OF COUPON DATABASE! I REALLY LIKE IT!! i will be using this advice next time I go to the store! I use all these sites and with Target Cartwheel it adds on with even more savings. The other one that I really like to save money and its not coupons is Checkout51! I often to go coupons.com but I’ve found if I stop at Swagbucks first, I can earn swag bucks for redeeming the coupon.com coupons! I’ve been wanting to get into using coupons but, I always have a problem with printing them up. thanks for all the great idea’s. Our public library now has a coupon cart with free coupons and inserts. It really helps me save and be able to stack coupons. thanks for sharing, as soon as I get a new printer, I can take advantage of this. Im super excited to start couponing. Thanks for sharing. I use Target and coupons.com mainly. Love new sites to save money! Thank you! I love coupons, and sometimes you can great amazing deals with the printed ones you cant get anywhere else! there are so many out there these days. Thanks for narrowing it down! Yes, I use all 4 of those. I like how the Target app will allow you to combine coupons on top of the digital coupons! YES! Thank you for putting this all in ONE place! I always am searching for the sites that have the best coupons and never seem to find where i was printing them from!so much time! i will have to find that ‘quick print” setting on my printer! i go through a TON of ink! I use those sources as well as other store sites like CVS. I use these four as well. I also look up brand sites I know I specifically am going to shop for. P&G usually has some coupons on their site or their Facebook page. Also, Swagbucks is easy to print from as well and you earn bucks for doing so! I’ve heard about a couple of these but not the others. I appreciate the list. I don’t really use coupons but I’ll probably start now! I always want to get in to couponing but I can’t afford a printer yet! So eventually, this post is going to be very helpful, thanks. I like coupons.com the best, I often have trouble with smart source. I’m always amazed at how many different coupons there are online. so nice to have them all! Thank you for taking the time to find good sources for coupons. I love online coupons that allow you to print out. Its a great way to save big money. The only issue I have found is struggling with certain stores to accept those coupons. Thanks for sharing the options of places to find the online coupons. Everyone should love saving money! don’t forget to check your favorite companies on facebook! They have tons of coupons for their fans! I often find couponing difficult because many of the coupons offered are for lots of packaged goods. We get almost all of our toiletries from Costco, and the bulk of our food is fresh produce. Any suggestions for saving money here? I’ve tried couponing before but the bulk of my grocery bill is from fresh produce. We buy most of our toiletries from Costco and make the rest ourselves. I’ll look into some of these suggestions though! Thanks for this list! I have looked before and never had good direction. Thanks for these! When I really like a coupon, I will email them and let them know. Many times they will send high value or free item coupons as a thank you. I need to take advantage of online coupons. I don’t get the newspaper, so I guess I always figured that I couldn’t join in on the couponing craze, but I’m glad to see that I can! I will have to get started! Thank you for the great information! I just became a Stay at Home mom and will be printing lots of coupons! I’m thankful to see this list of printable coupon resources. My neighbor uses these regularly and I’ll be happy to share these additional sites with him today. I am just now starting to coupon and learning soooo many things, I’m so glad I found your blog! Also I haven’t heard of any of those sites except for target but I didn’t even know target had coupons online. So thank you very very much for sharing! Online coupons are great! We look weekly before shopping. My daughter goes through these and loves how you can put a Target together with a manufacturer’s. I use target coupons a lot. Best to always print what you think you could use though cause they are gone quick! We are on a fixed income and coupons does save us money. Love using coupons and saving money. Thank you very much for this helpful information. I am now going to change my printer settings to Black and White because I have been printing in color thinking that the stores wouldn’t take them otherwise. I also didn’t know about printing using quick print. Again, thank you. I love coupons! I use all of these coupon websites!!! Coupons are a life saver for me. It takes time to cut and organize but if you keep up with it and do price matches, you will save so much money!! Thanks for sharing! I have been reading about how to coupon so I’m happy to find real coupon sites! Coupons are a great way to save. I always used coupons from enfamil whenever we buy some formula.Thus is a great read and target always have good coupons. Thank you for the tip about printer ink! I look forward to checking out these sites. I like using Inboxdollars.com for my coupons. Their coupon page actually goes to coupons.com, but you earn .10 per coupon that you use at the store. Walmart also has coupons on their site. Thank you for this posting since these are the only coupons I can get! Thank you for this post. I’ve been looking for links like these! Especially the Target one. Do you need a special program on your computer to be able to print these? Always looking for coupons. Thanks! Thank you for the tips! I usually only go to coupons.com, so I appreciate the links to sites I might not have found otherwise. I use the VONs app. It is the easiest way for me to save both money and time without having to actually clip coupons. I’ve been too lax about couponing since DD was born. Thanks for the reminder! I like finding great coupons to use! Good list. Thanks for sharing. I am lazy, so I just go to coupons.com in addition to the Sunday coupon circulars. I’m all about the coupons. I still can’t figure out the buy $300 worth of stuff for $25 yet, but maybe someday. For now I do use coupons on all the products I buy most to save where I can. I always go to coupons.com and I also load digital coupons to my shoppers rewards cards. I love IndyCouponMama.com she is a local blogger who matches ads with available coupons for stores in our area. I’ve gotten to know her pretty well online and through facebook. Let me tell you, without her, our groceries would be more expensive and it would take me so much longer to put the list together! Thank you, I use coupons.com, I always forget to buy a paper on Sundays. So being able to print out coupons is very helpful. I use all of them and like coupons.com a lot! Thank You for these coupon sites. I have to use match-ads and coupons because it’s the only way I can feed my family of 9 on $180-200 a week food budget. I have used Coupons.com a few times. I will have to check out the other sites. Most of the time I forget about using coupons, I should try to be better. Our HEB has in store coupons and I love those. I definitely need to check these sites out. I’ve never been very good at looking for coupons. I don’t think I’ve even heard of RedPlum.